The Surface Pro 4 has been a big hit so far, however the release hasn’t been without some hiccups. There have been several widely reported problems and bugs with the device, however there are a few workarounds that you can implement in order to make your computing life much more smooth. Most of these problems are within the software, and should hopefully be patched up by Microsoft very soon. However, until then we can tweak a few things in order to prevent problems. Here is a compilation of tips for helping to improve battery life and improve the touch pad sensitivity. Many people have reported that their Surface Pro 4 has been overheating and draining battery while in sleep mode. Users have reported that they have found their Surface super hot, with the fan running at full blast, when it should have been in sleep mode. They have also reported that the battery drains quite a bit in normal usage and they don’t get the advertised life out of their batteries with light web browsing. Another troubleshooting fix that may lead to increased battery life is to update the battery driver. Apparently the ones installed on Surface Pro 4 and Surface Books is from 2006. Apparently there is a new driver out from 2013 that has helped some people improve their battery life and have a properly functioning sleep setting, even with Windows Hello turned on. To do this, type “Device Manager” into the search box, open Device Manager, click the arrow carrot next to “Batteries” and then right click on “ACPI-Compliant Control Method Battery” and click Properties. If the Driver Date says 2006, click on Update Driver and allow the computer to search for a new driver and install it. This is worth a shot, and for some people so far it has fixed the battery drain in sleep issue. This is a relatively new strategy, however, and we still have yet to see how it performs for people over a few days. Another suggested fix that has helped some people is to disable the SmartScreen Filter in Settings. Go to Settings -> Privacy. Where it says “Turn on SmartScreen Filter to check web content…” click the slider to “Off”. This has helped some people improve their battery life. Wifi Sense is a feature of Windows 10 that allows you to share commonly known WiFi networks and passwords among your contacts. This is a newer feature and some people are not so sure that it’s such a good idea to let your laptop connect to non-secured networks anyway. Some users on Reddit have pinpointed this as a battery killer as sometimes Windows will be searching for other networks with better strength. In addition, it will be looking for networks while in sleep. For some reason this seems to be killing the battery more than it should be. In order to try this out, go to Settings -> Network & Internet -> Manage WiFi Settings. Turn off “Connect to Suggested Open Hotspots” and “Connect to networks shared by my contacts”. One culprit for battery drain during sleep seems to often be Windows Hello, which will keep the computer from going into full sleep mode. Disabling Windows Hello in the Settings -> Accounts -> Sign In Options will maybe solve this problem. We just have to wait until Microsoft offers a patch for this issue so we can go back to using the fun facial recognition features that Windows Hello offers. Note: So far after updating to the latest firmware (released on Nov 2, 2015) and updating the battery drivers, I have been able to use Windows Hello and sleep has been unaffected. Many people have also been complaining about the Surface Pro 4 trackpad. Although a huge improvement over earlier Surface models, it’s not perfect. Many people complain that it is unresponsive, slow, and lags–especially when using the two finger scrolling feature. This can be improved, however, by tweaking a few settings. 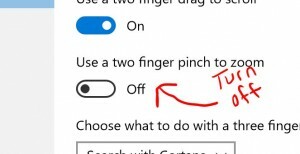 Go to Settings -> Devices -> Mouse And Touchpad and turn the option for “Use A Two Finger Pinch To Zoom” OFF. The two finger scrolling apparently waits a split second to ensure that you’re not doing a pinch to zoom gesture, hence the lag. Turning this feature off can greatly improve the two finger scrolling response time. When I tweaked this setting the two finger scroll response became nearly instant. 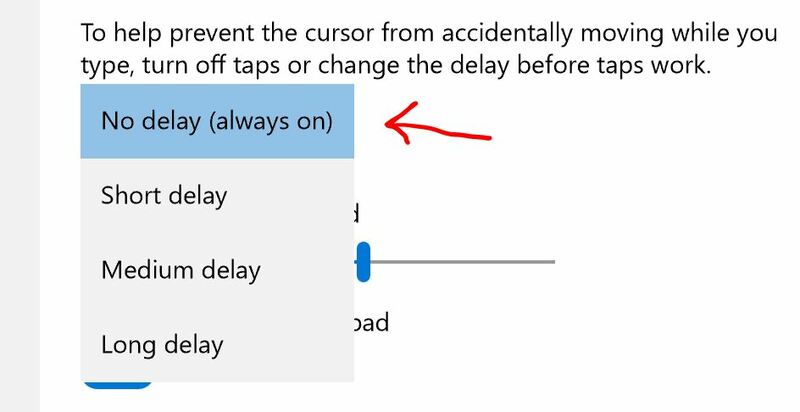 Another tweak that may help improve the smoothness is to change the delay to “No Delay (Always On)” where it says “To help prevent the cursor from accidentally moving while you type…” This allows for a more responsive trackpad for those looking for a better response time. The only downside to this is that you may occasionally hit the trackpad while typing until you can train your hands to stay off of it. Interestingly enough, the brightness keys (F1 and F2) on the Surface Pro 4 keyboard cover do not correspond to the screen brightness. They correspond to the keyboard backlight brightness. In order to control the brightness of the screen you must push”Fn+Del” or “Fn+Backspace”. The audio keys (F4, F5, F6) also only work if the Fn button light is off. If you press the Fn button to turn the light on, you will enable the F keys to work as F keys rather than control keys. Use caution when trying to use F5 to turn down the volume when watching web videos – you might end up reloading the page rather than controlling the volume. If you have any tips or tricks for the SP4 or Surface Book? Comment below or send us an email!